A touch of style that you can feel. For a refined look that adds a genuine carbon fiber touch to any device. Colors available in Black, Silver, White, Blue, Red, Pink & Green. For a sleek metallic design that adds a premium brushed feel. Colors available in Brushed Steel, Gold & Blue. For a touch of sophistication and glamorous appeal for any device. Colors available in White, Silver, Gold, Red & Purple. For those that oppose bulk and want to personalize any device without sacrificing product design. 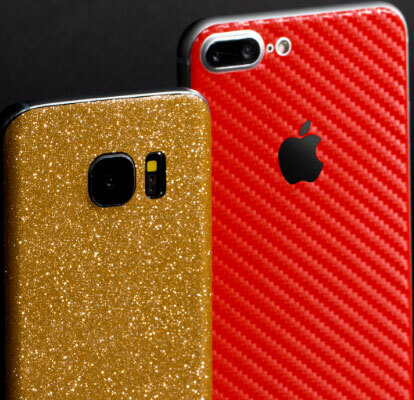 Skinit has engineered premium Textured Skins to precisely fit the contour of any electronic device and adds an ultra-thin layer of protection. Complement today's technology and modern product design with Textured Skins built for the bold. Each Skinit Textured Skin features laser-cut craftsmanship so you can peel device logo cut-outs if you want to show it off or leave them covered for a minimalistic device design.